Continued thanks for all the comments and insights that you send to Papergreat! Cheerful Card Company can help you earn extra money for the holidays: Anonymous writes: "How funny. I am 66 and was just telling my wife how I used to dress up and carry my briefcase with me ... 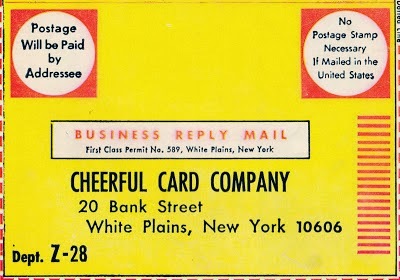 I was 11 or 12 ... knock on the door and say, 'I represent the Cheerful Card Company of (somewhere) New York and I would like to show you our line of Christmas Cards.' I didn't always make a sale but I did score milk and cookies on numerous occasions. I remember making enough one Christmas to shock my Dad and he wasn't shocked easily. What a fun read." Some vintage board games you probably won't get for Christmas: Tom Smithyman, a former roommate of mine at Penn State, writes: "Thanks for posting these, Chris. I don't think I ever owned any of these, but the Manhunt game reminded me of this scene from The Kentucky Fried Movie." The movie scene Tom references is a fake advertisement for Scot Free, a wildly inappropriate board game surrounding the investigation of the JFK assassination. Oliver Stone would approve. Celebrating J. R. R. Tolkien's twelvety-second birthday: Bonnie Jeanne (aka PostMuse) writes: "That font looks like Harry Potter, not Lord of the Rings." Interesting point. I kind of see what you're saying. 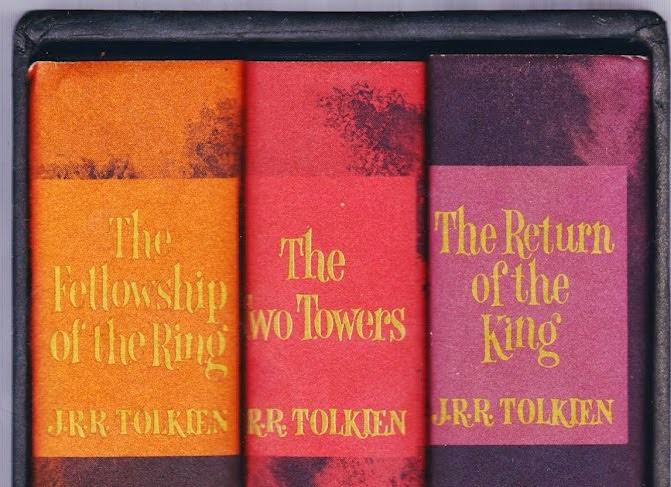 But given that these hardcovers were published in 1965, which is also the same year that J.K. Rowling was BORN, I think "firsties" go to the LOTR designers. Perhaps, many decades later, when seeking dust jacket inspiration, the Potter book designers perused some of the 1960s-riffic Tolkien cover designs? Enjoy these vintage recipes for the Everhot Electric Roasterette: A reader writes: "CE Swartzbaugh is my great-grandfather. I have enjoyed collecting some of the items made by the Toledo Cooker Company and successor Swartzbaugh Manufacturing Company's Everhot brand kitchen appliance and products. The Everhot brand was sold in around 1948-50 to McGraw Electric (later McGraw-Edison)." More snow in southcentral Pennsylvania: Anonymous writes: "Beautiful photos. I'm in Mechanicsburg looking at the same thing right now. Don't like driving in it, but it sure is an ethereal sight. Found your page while looking up Benders/Alpine Road Cemetery (as we just visiting there yesterday after ice skating at Pinchot Park). Great stuff on your site — keep up the fascinating work!" A trio of U.S. postage stamps from the 1970s: Jim Fahringer writes: "Thanks for the post about these interesting stamps. 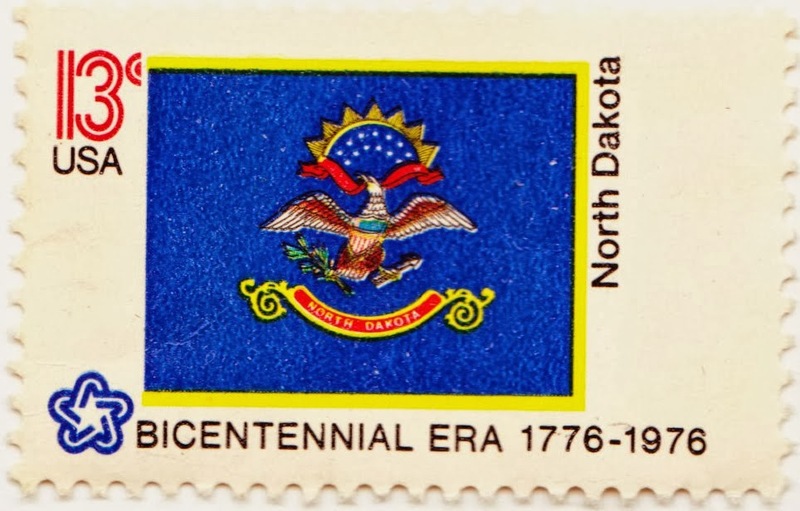 The sheet of 50 state flags is still one of my favorite U.S. stamp designs. The fact that this sheet of stamps was the first time the U.S. Post Office printed a sheet of stamps with 50 different designed stamps makes this stamp issue quite interesting to collectors. Normally, you would have several million sheets of a U.S. Stamp sheet printed with 50 stamps of the same design. Let's say the Post Office printed 5 million sheets with each sheet containing 50 stamps of the same design; that would give you a grand total of 250,000.000 million single stamps of the same design. That stamp would not be very rare with 250 million copies being made. On the other hand consider the stamp issue of 50 different state flags. Let's say the post office printed 5 million sheets of that stamp. Because there was only one design of any one one state in the sheet, you would only have 5 million copies of let's say the Pennsylvania state flag stamp. Any one particular stamp design of a state is much more scarce than if the sheet had contained 50 of the same design. That is why the 50 state flag stamps are more valuable than most other commemorative stamps. "However, with the issue of this stamp, another problem was created for stamp collectors - especially the young and those who didn't have a lot of extra cash. Now instead of buying just one mint stamp from a sheet of 50 for your stamp collection, you had to buy 50 stamps from the sheet for your collection. To keep your stamp collection up to date and include all stamps, you now found yourself in the position to spend 50 times more than what you would normally spend for a new stamp issue. Not to mention, if you collected first-day covers, you now how to purchase 50 different covers instead of just one. Coupled with several other Post Office decisions, you began to see a decline in stamp collecting. That is sad." Found recipes, Part 2: Whose box (and turketti recipe) was this? Ty Walsh writes: "The recipe cards with the old-fashioned stove and sleeping kitty are cards that my paternal grandmother used. Her name was Jean Ulrich. There is a story behind her use of these cards. She lived on the beach in Rockaway, Oregon. When you walked in the front door on your immediate left side was a stove just like that one. The cat under the stove resembled a cat that my mom and Grandma Jean had saved several times. The cat had been brought to where I lived and given to us. His name was Little Joe from Cocomo. Grandma told me that Grandpa Gil named the cat. I have 2-3 of her recipes on those cards. Would love to find some blank ones." Thanks for sharing those great memories, Ty. I am sorry to say that I don't have any blank cards of this type. 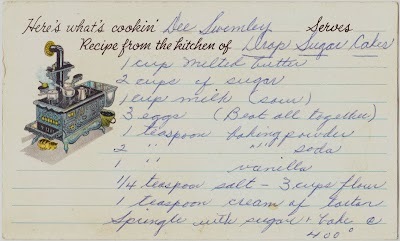 One good place to look for them is on Etsy, which features numerous vintage recipe cards. Space-age pictures from a 1964-65 Futurama brochure: Sandi writes: "My parents went to this fair. I remember well all the fascinating information they brought back. Still waiting on that future life." 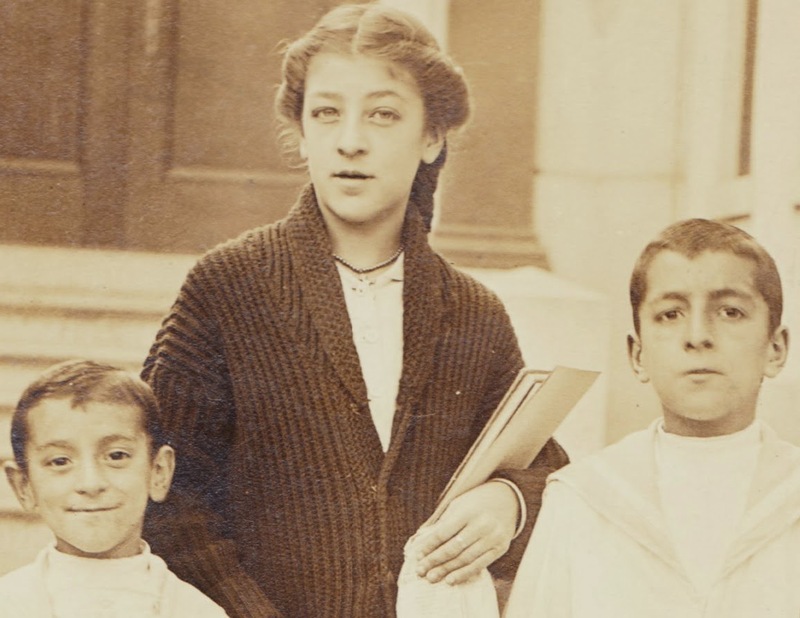 Mystery real photo postcard: Who were these three kids? Bart Ingraldi, who authors the ephemera blog PaperSleuth.com, writes: "At first glance the card look European. The children look Italian, even the boys outfits give a hint to this."